On Tuesday, April the 12th, Jerry & I drove to Temple University in Philadelphia to hear Nonie Darwish, who is the author of Now They Call Me Infidel and Cruel and Usual Punishment, also the founder of “Arabs for Israel” & co-founder of “Former Muslims United.” She’d been invited by a student group at Temple which, unlike some other student clubs in recent years, did not brazenly rescind its invitation to her at the last minute. When I went over to greet her before the talk, she thought she recognized my name, something I did not expect. Well, a person in public life has to know how to file names. In late December of 2009 and early January of 2010, I’d written letters of strong protest, and reproof in “professorial” style, to the presidents of the two student clubs (Whig-Cliosophic Society and the misnamed Tigers for Israel). I also wrote the young woman Rabbi/Executive Director of the Center for Jewish Life, Hillel at Princeton, who had been active beyond (& I would say against) the call of duty in getting those two student clubs to withdraw their invitation. The Tigers for Israel president added gratuitously defamatory explanations for extraordinary rudeness. On the same occasion, I sent indignant emails to The Daily Princetonian and the Princeton Alumni Weekly, and finally one to Nonie Darwish, closing with my “very deep regard for your courage, rationality and goodness.” But, as I’d heard nothing further, I supposed that the email to the insulted speaker might have been misaddressed. No, apparently not. She apologized (unnecessarily) for not having answered, explaining that her world is inundated with emails. I again expressed my indignation at what had happened at Princeton (& Columbia!) and the “anticipatory dhimmitude” it represented. At those words she nodded emphatically. I added, “You are a warrior, like your poor father, but in a good cause!” The father of Nonie Darwish was a shahid (terrorist who died trying to kill Israelis and got subsequently revered as hero/martyr). We embraced. The Hall where she spoke was large, and the meeting open to the public. There were no organized protesters. Jerry & I sat in the front row. I’ve never been at an event where the speaker was under a death threat. Purses and backpacks were not screened, but five or six security guards, one with a dog, were visible – all sitting well back from the speaker. Perhaps the somewhat unruly venting – pro and con – from the audience was triggered by displaced fear. (As if they had to shout something, since they couldn’t run and they couldn’t scream.) The speaker also had to contend with nonworking microphones & construction noises from outside the building. Nonie Darwish began her story. She was born in Cairo in the 1950’s, and grew up in Gaza under Nasser. She lived her whole childhood in the Arab/Israeli conflict. It was the overriding subject, in schools, cartoons, media, and sermons. Her father started the fedayeen (self-sacrifice) operation whose assignment was to destroy Israel. She learned hatred and retaliation – not exactly normal lessons for children. Peace was never mentioned as a value. Only “jihad” against Jews. “Jihad,” she explained, is not inner struggle. It is not yoga or self-analysis. In the Middle East, everyone knows what “jihad” means. It’s sharia’s obligatory war against nonMuslims, to establish Islam. The sovereignty of nonMuslim states cannot be conceded (except tactically). By the same token, international law cannot supercede sharia law. Unbelievers must either convert or agree to pay a tax, while being made to feel demeaned/humiliated. She and her school friends were filled with fear of Jews who, they were told, “love to kill Arab children.” Victimhood is essential to jihad. After her father was killed, the family moved back to Cairo. Nasser paid them a condolence visit. This powerful man put a paternal hand against her cheek and asked, “Which of you kids will avenge your father’s death by killing Jews?” If she didn’t want to do that, she’d be considered disloyal. Noted: at that time, Israel was not in Gaza, not on the West Bank. The ideology of terrorism wasn’t caused by “occupation,” but preceded it. 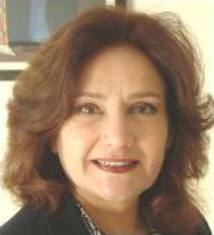 Nonie Darwish made a deliberate effort to recognize and address listeners who objected to or denounced what she had to say. She emphasized that her quarrel was with this legal system and tradition, not with Muslims as people, who include many for whom she has the greatest love and the highest respect. Nobody, she said, wants to single out or speak against particular religions. What she speaks against is a legal system. If a purported religion becomes a political actor, or a state, demanding its own legal system, claiming to supercede other legal systems, proposing to execute nonbelievers & to violate the sovereignty of nations, or the rights of groups and individuals in the Dar al Harb (the realm of war, i.e. unbelief), that religion opens itself to criticism and has no right to religious protection. Tolerance of intolerance is not a virtue. It does no favor to Muslims. Political correctness is not compassion. It is negligence. This woman of large stature, under threat of assassination – to whom we sat near enough to be in her line of fire – impressed me very much. She is, she told me privately afterward, in contact with a number of young Egyptian women who survive by concealment or hiding. Her image follows me. I see her as a hero, one of those giants who arise out of the very cauldron of their historical situation -- a figure who will not forsake the meaning of her life and the sorrows to which she bears witness. She does what the covenant obligates Jews & their spiritual descendants to do: partner with God in history.